Minister KT Rama Rao formally launched Telangana State Innovation Cell’s Startup India Telangana Yatra on September 15, 2018, in Hyderabad. Startup India Telangana Yatra is an attempt to promote entrepreneurship in tier II & III cities of the state. The yatra will happen in 12 districts between September 15 & October 5. The yatra will spread awareness about the state innovation policy & the initiatives taken by the state. Telangana State Innovation Cell (TSIC) launched Startup India Telangana Yatra in collaboration with Invest India and Startup India under the Department of Industrial Policy and Promotion. During the tour in boot camps, budding entrepreneurs will get a chance to be mentored by successful entrepreneurs and active players of the startup ecosystem and also can pitch their idea and, if selected, entrepreneurs will get incubated under the acceleration programme and give wings to their entrepreneurial dream. 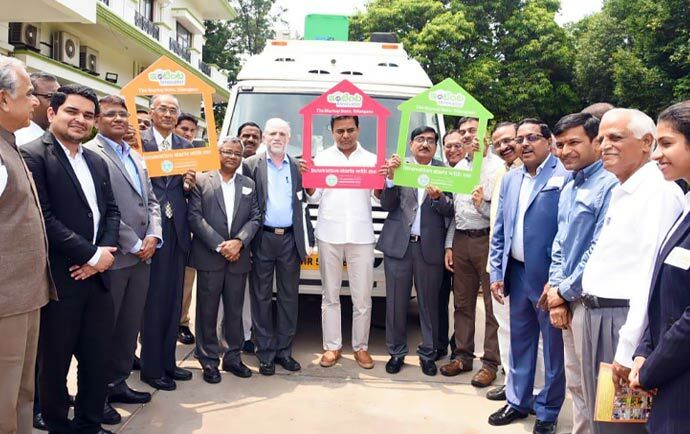 To ensure the Yatra benefits every individual across the state, a ‘Startup India Mobile Van’ will stop at thirteen destinations between September 14 and September 29. It will spread awareness about the initiatives taken by the government to promote entrepreneurship in Telangana. The vehicle will have experts on board who will provide an opportunity for entrepreneurial talents to pitch an idea. It aims to scout grass root level entrepreneurs in the smaller towns of India, providing a platform for budding entrepreneurs. The Yatra aims at making entrepreneurship and innovation as a colloquial term in Telangana where everyone knows about it and speaks about it. Jayesh Ranjan, Principal Secretary, IT & Industries Dept and Phanindra Sama CIO of Telangana State Innovation Cell were the other dignitaries who participated in the program.